Joggernauts is a cooperative auto-runner party game from Space Mace. It is for 2-4 players where you try not to kill your friends. 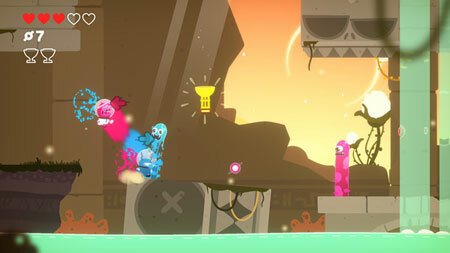 Take turns to lead your team through deceptively difficult color-coded platforming levels. Help the alien athletics team find all of their missing trophies. Yell colors at your friends. The game features unique switch-to-front teleportation mechanic, color-coded cooperative puzzles, completion challenges, and unlockable characters. If you get stuck in the game, check out the video walkthrough and gameplay for the game. This entry was posted in PC Games, Walkthrough and tagged Joggernauts Bonus Levels, Joggernauts Cheats, Joggernauts Game, Joggernauts Gameplay, Joggernauts Guide, Joggernauts Hints, Joggernauts Review, Joggernauts Solutions, Joggernauts Strategy, Joggernauts Tips, Joggernauts Walkthrough by Marvin. Bookmark the permalink.